WASHINGTON -- Politics, budgets, schedule pressure and managerial complacency all played roles in causing the Feb. 1 Columbia tragedy, the Columbia Accident Investigation Board (CAIB) said in its final report released today. The 248-page report, formally released at 10 a.m. EDT (1400 GMT), lays out in detail what has already been said about what went wrong -- both from a physical and organizational point of view -- and lays out what NASA needs to do before it returns any of its three remaining orbiters to the launch pad. The CAIB was established within the first 24 hours of Columbia's breakup over the western United States. Within three days of the accident, retired U.S. Navy Adm. Harold Gehman had reported for duty as the board's chairman and was leading an expedition to Texas and Louisana to tour Columbia's debris field. The cause of the accident was not immediately apparent. By the time the board concluded its five-month investigation, their was little, if any, doubt among investigators about the physical cause of the accident: Columbia attempted to re-enter and land the morning of Feb. 1 with a breach in its left wing inflicted some 16 days earlier by a breakaway chunk of foam 81.7 seconds after liftoff. "In four simple words, the foam did it," said the board's only NASA official, Scott Hubbard, who oversaw the dramatic foam strike tests at Southwest Research Insitute, San Antonio, Texas. Hubbard emphasized the board's confidence in its conclusions about the technical root cause of the accident, pointing out that "we didn't include the words probably, probable or most likely." As Gehman had promised on many occasions since the investigation got underway nearly seven months ago, the report goes well beyond the root technical cause of the accident and provides an integrated assessment of the cultural, political and budgetary factors at play. During the weeks leading up to the release of the report, senior NASA managers warned agency personnel that they should brace for a scathing indictment of the NASA culture. On this point, the report delivers. But there is also plenty of blame to go around. "The past decisions of national leaders -- the White House, Congress, and NASA Headquarters -- set the Columbia accident in motion by creating resource and schedule strains that compromised the principles of a high-risk technology organization," the reports says. "The measure of NASA's success became how much costs were reduced and how efficiently the schedule was met. But the space shuttle is not now, nor has it ever been, an operational vehicle. We cannot explore space on a fixed-cost basis." Investigators said they found NASA's human spaceflight organization to be "in most cases... extremely aggressive in reducing threats to safety. But we also know -- in hindsight -- that detection of the dangers posed by foam was impeded by 'blind spots' in NASA's safety culture." But, as anticipated, the report also heaps considerable blame on NASA's organizational culture and its role in the accident. "The organizational causes of this accident are rooted in the space shuttle program's history and culture, including the original compromises that were required to gain approval for the shuttle, subsequent years of resource constraints, fluctuating priorities, schedule pressures, mischaracterization of the shuttle as operational rather than developmental, and lack of agreed national vision for human space flight." The report goes on to say: "the NASA organizational culture had as much to do with this accident as the foam." The board also found echoes of the 1986 Challenger disaster during its investigation of the Columbia accident. Time and time again, investigators were struck by similarities and parallels between the two disasters, though 17 years apart. "For both accidents there were moments when management definitions of risk might have been reversed were it not for the many missing signals -- an absence of trend analysis, imagery data not obtained, concerns not voiced, information overlooked or dropped from briefings," the report says. Board members also found that lessons NASA learned in the aftermath of the Challenger disaster have to a large degree been forgotten or ignored during the years since. As board member U.S. Air Force Maj. Gen. John Barry told reporters after release of the report "there is still evidence of a silent safety program with echoes of Challenger." In talking to reporters and addressing the many television cameras that attended the release of the report, board members also took care to temper their criticism of NASA's organizational culture with praise for the NASA team. "If the board set out to spend seven months looking at all the good things NASA does, the report would be thicker than this," Gehman said, holding up his inch-thick bound copy of the Columbia accident report. U.S. Navy Rear Adm. Stephan Turcotte, a board member who spent a lot of time with the space shuttle program's rank and file, concurred, praising the space shuttle workforce for their "hearts and souls." "These are good people," Turcotte reported. "The people down there working [on the space shuttle program] are working their hearts out." A 34-page section of the report, "Decision-Making During the Flight of STS-107," recounts the now familiar tale of missed signals, botched imagery requests and a mission management team largely oblivious to the mortal danger Columbia and her crew were in. The report details eight separate "missed opportunities" during the 16-day flight, from NASA engineer Rodney Rocha's unanswered e-mail four days into the mission asking Johnson Space Center if the crew had been directed to inspect Columbia's left wing for damage to NASA human space flight chief William Readdy's failure to accept the U.S. Defense Department's offer to obtain spy satellite imagery of the damaged shuttle. The report excoriates NASA management decisions during Columbia's last flight. "Perhaps most striking is the fact that management . . . displayed no interest in understanding a problem and its implications. Because managers failed to avail themselves to the wide range of expertise and opinion necessary to obtain the best answer to the debris strike question . . . some space shuttle program managers failed to fulfill the implicit contract to do whatever is necessary to ensure the safety of the crew." Although the report names the key personnel who participated in the debris strike decision, the board does not single anyone out for blame or explicitly call for their ouster. "It is tempting to conclude that replacing them will solve NASA's problems," the report says. "However, solving NASA's problems are not quite so easily achieved. People's actions are influenced by the organizations in which they work, shaping their choices in directions that even they may not realize." The report also depicts the broader political scene that helped set the stage for the Columbia accident. "The causal roots of the accident can also be traced, in part , to the turbulent post-Cold War policy environment in which NASA functioned during most of the years between the destruction of Challenger and the loss of Columbia," the report says. "The end of the Cold War in the late 1980s meant that the most important political underpinning of NASA's Human Space Flight Program -- U.S.-Soviet space competition -- was lost, with no equally strong political objective to replace it." The loss of the Soviet Union as a competitor in the human space flight arena made it difficult for NASA to obtain budget increases through the 1990s. But rather than adjust its expectations to the new realities, the Board said, NASA continued to push an aggressive agenda that included the development and construction of the international space station. With no budget increases in sight, NASA's only recourse was to try to do more with less. 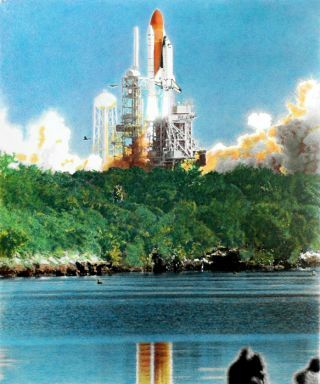 Enter recent NASA Administrator Daniel Goldin and his "Faster, Better, Cheaper revolution, an era the report characterizes as "one of continuous turmoil, to which the Space Shuttle Program was not immune." The watchword throughout the agency in the 1990s was efficiency. For the space shuttle program, as well as a host of other NASA efforts, outsourcing and contract consolidation was part of the solution. "The search for cost reduction led top NASA leaders over the past decade to downsize the Shuttle workforce, outsource various Shuttle Program responsibilities -- including safety oversight -- and consider eventual privatization of the Space Shuttle Program," the report says. Over the past decade, according to the report, the program's purchasing power was reduced 40 percent and "repeatedly raided" to cover mounting space station bills. Notably abscent from the report is a detailed assessment of the roles that NASA's contractors played in the accident. While the report recounts the rationale behind NASA's decision to consolidate dozens of space shuttle operations contracts into a single contract awarded to the Lockheed Martin-Boeing joint venture United Space Alliance, the board stopped short in giving an opinion on the impact of that outsourcing effort on shuttle safety. However, the report was not silent on the need for more civil servant oversight of development efforts like the space shuttle program. One NASA contractor said the report's recommendations are almost certain to influence how NASA structures contracts for human space flight-related services in the future. The report also calls into question renewed schedule pressure introduced into the space station and space shuttle programs as Sean O'Keefe was preparing to take over as NASA administrator in January 2002. O'Keefe, who as deputy director of the White House Office of Management and Budget, put NASA on notice in 2001 that it was expected to get the space station program back on track and that a budget bailout was not in the works. Before the end of O'Keefe's first year as NASA administrator, the U.S. space agency had shocked and angered its international partners by cutting key contributions to the space station program in order to eliminate a looming $500 million overrun. The program also began driving toward a very specific completion date: Feb. 19, 2004. During its investigation, the Board received several unsolicited comments from NASA personnel regarding pressure to meet that date. Board members at first thought the target date for completing the core space station noteworthy but unrelated to the accident. But as the investigation continued, the report says, "it became apparent that the complexity and political mandates surrounding the international space station program, as well as shuttle program management's responses to them, resulted in pressure to meet an increasingly ambitious launch schedule." The report also holds up several organizations as embodiments of the right way to manage risk and exemplars of largely accident-free performance. Those organizations are the U.S. Navy Submarine Flooding Prevention and Recovery (SUBSAFE) program; Naval Nuclear Propulsion programs; and the Aerospace Corporation's Launch Vehicle Verification Process, which supports U.S. Air Force space launch operations. All these organizations, which the board praises for maintaining impressive safety records in the face of considerable technical risk, have at least one major characteristic in common: "they place a premium on safety and reliability by structuring their programs so that technical and safety engineering organizations own the process of determining, maintaining, and waiving technical requirements with a voice that is equal to yet independent of program managers," the report says. NASA already has taken the initial steps toward emulating these organizations. Since the accident, O'Keefe has transferred Kennedy Space Center director Roy Bridges to Langley Research Center in Hampton, Va., where the former astronaut and Air Force general will oversee the establishment of a new safety and engineering center. Bridges said last week he would seek a "generous" testing budget for the center, which is intended to give more clout to NASA's safety watchdogs. In the end, the board concludes that NASA can resume space shuttle operations provided a number of changes are implemented before the first orbiter is rolled out to the launch pad. The major recommendations -- develop an on orbit inspection and repair capability, toughen the orbiter, prevent the external tank from shedding foam, train more cameras on the shuttle during liftoff and, with the help of U.S. spy satellite agencies, during orbital flight -- had already been publicly released before publication of the final report. The report also includes 10 new recommendations that NASA must implement before it returns to flight. Most of them, however, merely add specificity to earlier recommendations. For example, the board goes into greater detail about what kind of camera views NASA should obtain of every launch. Brand new recommendations include establishing a space shuttle flight schedule that is "consistent with available resources, creating an independent Technical Engineering Authority and independent safety program, maintaining more oversight of final tank foam application processes. Another recommendation suggested by the board but not previously formally released, is for NASA to redesign a bolt catcher assembly that CAIB-ordered testing revealed to be possibly too weak to do its job. NASA officials announced a few months ago that they were redesigning this part. Among the most technically challenging of the recommendations, several board members agreed, is the recommendation that NASA develop a capability to inspect and repair while in orbit the reinforced carbon carbon that protects the leading edges of space shuttle wings. Board member Sheila Widnall, a former U.S. Air Force secretary, said the reinforced carbon carbon requirement is the one most likely to slow NASA's return to flight. The board also puts forward some longer term goals for NASA, including inspecting and recertifying the shuttle's hundreds of miles of wiring as part of the agency's Shuttle Service Life Extension Program, an effort kicked off earlier this year with the goal of keeping the shuttle in good working order through the end of the decade and beyond. But on the subject when to retire or replace the shuttle, the board is "agnostic," in the words of board member John Logsdon, director of the Space Policy Institute at George Washington University, explaining that NASA could very well conclude that recertifying the shuttle is too difficult or too costly to undertake. "We believe another vehicle, whether to complement or replace the shuttle, is very, very high priority," Gheman said. "We criticize the U.S. for finding ourselves in the position we are in now where we don't even have a design on the drawing board." On these longer term recommendations, the report sounds a sobering note: "Based on NASA's history of ignoring external recommendations, or making improvements that atrophy with time, the Board has no confidence that the Space Shuttle can be safely operated for more than a few years based solely on renewed post-accident vigilance."